This Amethyst Engagement Ring is individually handmade, it is slightly irregular, lightly hammered & hand brushed, for a satin finish. 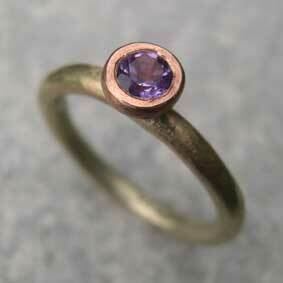 4mm Amethyst - in a red gold pillow setting, on 9ct yellow gold 2.4mm ring. Amethyst set in red gold nugget. We will make sure your ring fits you perfectly. Diamond, Ruby, Sapphire, Emerald, Topaz. Email or phone us for a quote.